Audi has confirmed a new, all-electric SUV will be revealed at the Frankfurt Motor Show. With a potential range of more than 310 miles, it builds on the experience gained developing the forthcoming R8 e-tron, the brand's first large-series electric car, which enters production in 2018. The new e-tron quattro concept is designed from the ground up as an electric car and follows Audi's 'Aerosthetics' concept - combining technical measures for reducing aerodynamic drag with creative design solutions. Movable aerodynamic elements at the front, on the sides and at the rear improve the air flow around the car. The aerodynamically optimised underbody is completely closed. With a cd value of 0.25, Audi says the concept sets a new record in the SUV segment, helping contribute to the long range of more than 310 miles. The study is based on the second-generation modular longitudinal platform, which provides 'considerable scope' for the drive system and package. Its length is between that of the Audi Q5 and the Q7, with its SUV body and flat, Coupe-like cabin giving the concept a dynamic appearance, while a spacious interior offers room for four people. The large lithium-ion battery is positioned between the axles and below the passenger compartment. This installation position provides for a low centre of gravity and a balanced axle load distribution, giving the car 'better driving dynamics and driving safety than other vehicles in the segment' according to the German brand. Three electric motors - one on the front axle and two on the rear - effectively create an 'electrified quattro', making the e-tron quattro concept both efficient and responsive. 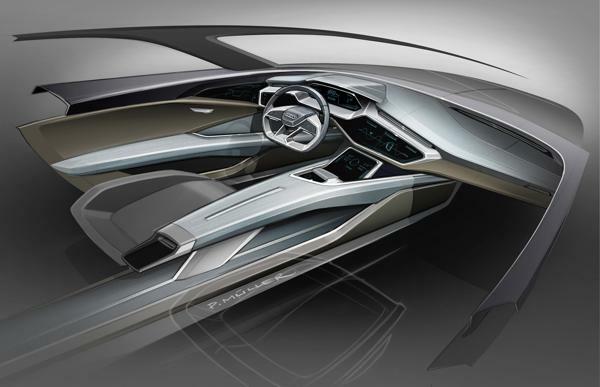 Audi's first ever purely electric SUV is destined for series production following its Frankfurt debut in concept form. The Motor Show opens its doors on 17 September.